Gas regulator noises may include humming, hissing, and other sounds. While many gas grill and some other appliance manufacturers say a bit of humming at the gas regulator for appliances is normal and harmless, not everyone agrees. This article series explains LP or Natural Gas Pressure Regulators used on building appliances such as gas fired furnaces, boilers, water heaters, and stoves: How to Inspect & Test LP or Natural Gas Valves Regulators, or Gas Controls at Appliances. Gas regulator noises: while many gas grill and some other appliance manufacturers say a bit of humming at the gas regulator for appliances is normal and harmless, not everyone agrees. Certainly if there is a gas odor or gas leak, the gas supply should be shut off immediately and you need to call a professional for diagnosis and repair of the trouble. Some experts explain that over time a humming gas regulator may become unsafe; and there are other noises that have other meanings at gas regulators, pipes, and LP gas tanks. 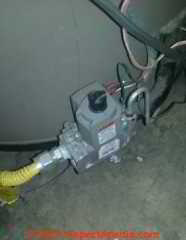 I have a Wayne natural gas burner insert that replaced my oil fired Beckett burner in my furnace. Occasionally there is a buzzing noise that is coming from the combination gas valve. It is rare, intermittent, and stops after a minute or so, and usually does not reoccur this heat cycle. The flame looks normal and the heater operates normally before/during/after each event. What is this? Is it dangerous? Does it mean the gas valve is failing? There is nothing in the troubleshooting manual about this problem. I'm not expert on gas regulator noises but from reading advice from some appliance manufacturers and from several gas distribution companies I can suggest some regulator noises and their possible causes. Watch out: But before going through noise sources, make darn sure that any hissing you hear is not a gas leak as a gas leak risks fire and explosion. If you suspect a gas leak shut down the gas supply immediately. An important point to note is that under normal operation, a propane regulator will make a "humming" noise. This is normal and should not be construed as a problem or regulator malfunction. But as you’ll read below, some experts warn that over time a humming gas regulator that is not leaking and that is deemed “safe” may become unsafe as it may be damaged over time by vibration. Check for buzzing that is actually coming from a nearby low-voltage transformer. If that's the source, replace the transformer. Clanking noises at the gas regulator: One gas supplier we consulted mentioned a clanking sound in LP tanks traced to a loose gas level float assembly. Gurgling Humming at the gas regulator - Over-filled LP tank: can produce a humming or gurgling sound heard in the gas piping or at the regulator. This is a serious problem as it is sending excess pressure and possibly liquid fuel into an appliance regulator designed only for gas and lower pressure. Feeding fuel from an over-filled LP gas tank can also cause regulator damage as liquid LP can slug the regulator. According to some gas suppliers, an over-filled LP gas tank can actually cause abnormally low gas flow through the regulator and thus a reduced appliance gas flame. Watch out: DO NOT try to fix an over-fill problem yourself - trying to release excess LP gas can blow the place up or burn it down. Hissing sounds at the gas regulator (not everyone uses the same terms for the same sounds) may be from a gas leak. Sniff for gas - and have your system tested for gas leaks. Hissing also occurs through a ventilation hole that releases air from the atmospheric side of the gas regulator - this is normal but it should not be continuous. If you smell gas there is a leak: that would be unsafe - in that case shut off the gas. Hissing may also come from gas being released from a safety valve at the gas tank or regulator. That too indicates an unsafe condition. Watch out: If you smell gas - there is a gas leak - the system is unsafe; the gas supply should be shut off and then you should call for repair. The risk is fire or explosion. Humming, buzzing, hissing noise at the gas regulator: Diaphragm noise: Most-often humming or buzzing at a gas appliance regulator is traced to the gas regulator diaphragm. Some manufacturers (charbroil.com & napoleongrills.com for example) consider this normal as a function of variations in temperature, barometric pressure, and relative humidity and say ignore it. Weber, another gas grill manufacturer says the noise is safe as long as it’s not accompanied by a gas leak (or gas odor indicating a leak). But as you’ll see at the end of my notes, Zafer (2008) warns of possible regulator damage that could be unsafe. This is more likely to occur with LP gas systems than with piped-in natural gas systems. Try this: slightly close the gas supply valve; that won't change the system pressure but it'll restrict the gas flow slightly. If that makes the buzzing/humming noise stop you're probably seeing a regulator diaphragm. vibration issue. Most gas heater/appliance regulators use an internal rubber diaphragm. that might be damaged, perforated, or its spring may be sticking; in those cases the regulator needs repair or replacement. Watch out: if you smell gas, for example if gas is leaking through a perforated gas regulator diaphragm, the system is unsafe and should be shut down. Knocking and pinging sounds at the gas regulator: other gas appliance regulator noises include a knocking or pinging sound that can be caused by improper mixing of gas and air at the LP gas tank. If you see yellow or white-blue instead of mostly blue flames with a yellow tip then this may be the trouble. You’ll need to have your LP gas service tech inspect and repair the equipment. Various noise sources at the gas regulator - Air trapped in gas piping or water or rarely ice in the regulator: - that might be from a contaminated fuel source, possibly transient. If trapped air is the problem, purging the gas line between appliance regulator and tank ought to correct it. Watch out: Zafer (2008) points out that while humming and vibration at appliance gas regulators is a common problem, it is ultimately unsafe because the vibration in the regulator leads to component fatigue damage and regulator failure “if left unchecked”. Zafer, Naci, and Greg R. Luecke. "Stability of gas pressure regulators. "Applied Mathematical Modelling 32, no. 1 (2008): 61-82. D.J. Kukulka, A. Benzoni, J.C. Mallendorf, Digital simulation of a pneumatic pressure regulator, Simulation (1994), pp. 252–266. Dyck, R. I. J. "Residential gas regulators." Pipeline & gas journal 215, no. 7 (1988): 30-33. Kam, Wng. "Measuring and reducing control valve noise pollution. "Instrumentation & Control Systems 67, no. 11 (1994): 59-69. To me that sounds like a buzzing sound right at the heater control or burner. This isn't a high-efficiency water heater, right? I see what looks like a large black gas supply tube (to the burner) and a smaller diameter aluminum tube presumably feeding a pilot. Is that right? Could there be a buzzing igniter? Do you have other gas appliances and are they working normally? That'd reduce the chances of a problem at the gas supply or main gas regulator. The system may be unsafe. and for a more exhaustive list of sources of noises at water heaters see WATER HEATER NOISE. It was the only device acting up, and we had the burner assembly replaced, so all is good now. Throughout the off and on buzzing period, the unit continued to heat, and my friend, colleague & owner of our business was too distracted to take the action our regular plumber had recommended. Eventually the buzzing stopped, and so did the heat. The repair cost approx $600, and apparently we had to replace the same burner assembly 2-3 years ago at this laundromat location. To me that sounds like a failing control, probably an electrical component, or an igniter, though on occasion gas regulators can be noisy too. If a specific failure repeats itself I figure there's some underlying problem that's not yet been identified. Continue reading at GAS REGULATORS for APPLIANCES or select a topic from closely-related articles below, or see our complete INDEX to RELATED ARTICLES below. GAS REGULATOR NOISES at InspectApedia.com - online encyclopedia of building & environmental inspection, testing, diagnosis, repair, & problem prevention advice. National Fire Protection Association (NFPA) Pamphlets No. 54 and 58. "Gaslight", Gary Quilliam, The Old House Journal, March/April 1989 article describes fixtures, modern fixtures, and sources of supply.